The Journal of Adaptive Behavior has recently published a target article by Barbara Webb entitled “Animats vs. Animals”. I was invited to write a critical response to her paper and joined Anthony Chemero to defend a variety of models in science, ranging from the most concrete to the most abstract. 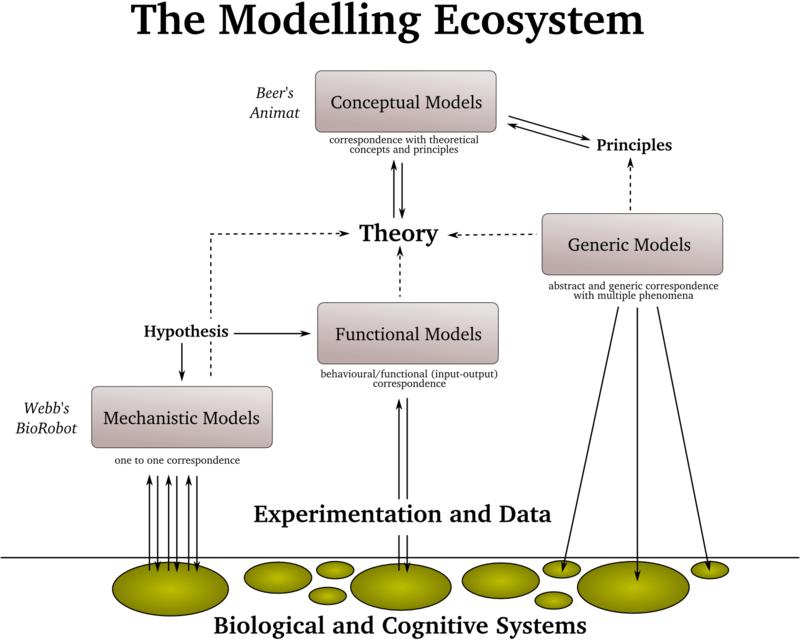 As a short summary the graphic above (click the image for a lager view) shows a diagramatic representation of the types of models and their relationship with theories and empirical data. Barbara Webb style models are but one of the possible models that are useful to science, not the only one. Barbara Webb is a well known roboticist due to her robotic models of cricket phonotaxis, used as tools to behavioral and neurobiological discovery. On her paper Webb argues that artificial robotic models need to target specific animals, as she does, putting into question the epitemic value of abstract (or conceptual models), such as those of Randall Beer and, altogether, great part of Artificial Life and Simulation of Adaptive Behaviour research. Together with Anthony Chemero I have argued back that the modelling ecosystems is rich and populated by a variety of modelling practices, some of which are one-to-one representations of existing target animals, and yet others are not, and cannot be so if they are to fullfil their epistemic role. Such is the case of conceptual models whose use is of foundamental importance as a theoretical guide to discovery in complex fields of knowledge (such as biology and cognitive science). Barandiaran, X. E. & Chemero, A. (2009). Animats in the Modeling Ecosystem. Adaptive Behavior 17: 287—292. Eduardo Izquierdo-Torres has also made some intereting comments on his website regarding the discussion with Barbara Webb (he includes links to some of the commentaries also), don’t miss it.